Looking for VIP pricing and floor plans? Set up your email to receive exclusive information on amenities and more! AXIOM’s hotel inspired amenities greet you at ground level with the elegant Port Cochere and carry through to the top with the breathtaking rooftop Sky Deck. From the exhilarating fitness studio to the serene yoga room to the lush outdoor terrace, AXIOM takes luxury living to new heights. 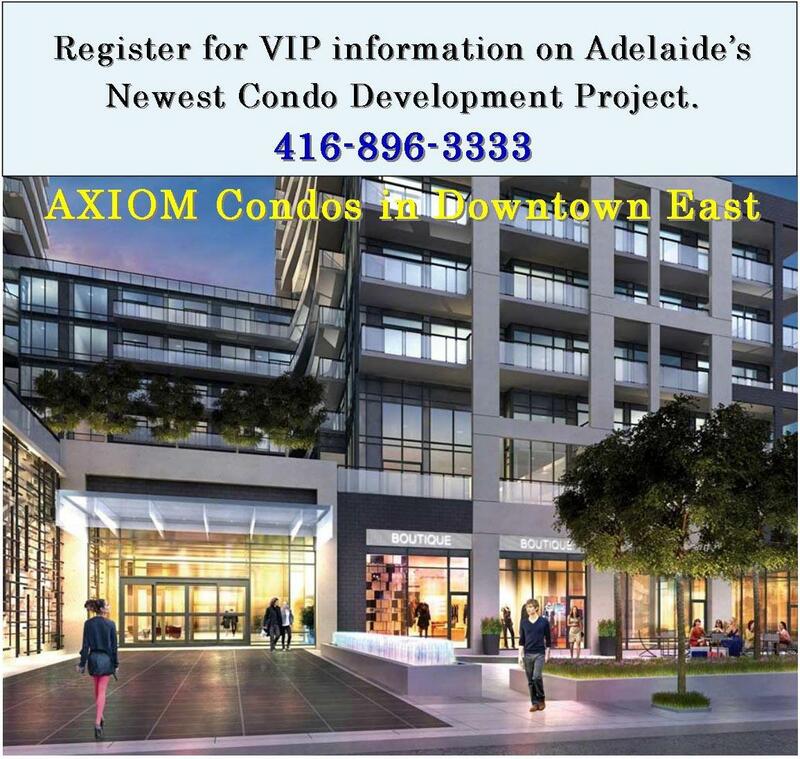 AXIOM’s Main Floor Lobby is the epitome of urbane design and stylish sophistication, featuring a 24/7 concierge. This exquisite, inviting space brings the enchanting exterior art wall inside, in a breathtaking design transition that creates a dramatic sense of arrival for both residents and guests alike. The north entrance of AXIOM features a private Porte Cochere you will appreciate year round. Accessed off Ontario Street, this refined point of entry, or departure, creates an elegance usually found only in chic hotels. At AXIOM, the fashionably appointed Sky Deck is the ultimate setting for dining alfresco, relaxing with a good book, sunbathing, or taking in the spectacular skyline day or night. The bustling St. Lawrence Market is a focal point of AXIOM’s Downtown East neighbourhood just a few minutes’ walk from your front door. Ranked as the “world’s best market” by National Geographic, this charming culinary destination dates back to 1803 and boasts over 120 specialty food vendors renowned for the variety and freshness of their offerings. The Market is part of a rich assortment of “foodie” friendly establishments close to AXIOM that range from bohemian to baroque and beyond. A vibrant mix of eclectic destinations, Downtown Toronto East boasts an exciting urban vibe that sets it apart from the rest of the city. Walk, cycle or TTC to St. James Park and George Brown College on King, sidewalk cafes and shops on Queen, Lake Ontario’s Sugar Beach, the new West Don Lands, Leslieville and the world renowned St. Lawrence Market. 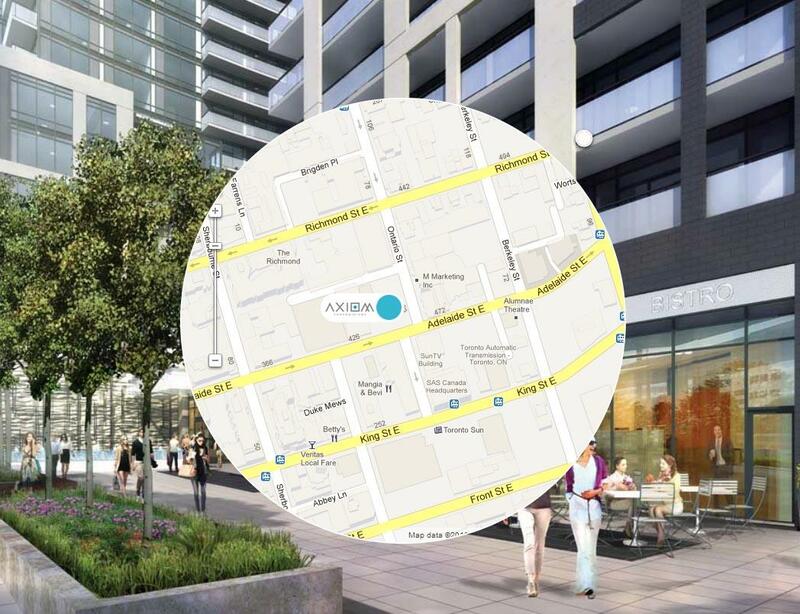 Rendering of West Donlands courtesy of Waterfront Toronto. Escape into nature in this impressive downtown oasis. The new Don River Park is an 18 acre urban paradise offering soccer and lacrosse fields, nature paths, water features and a concert space. Boasting impressive views of downtown, this park is sure to become a top Toronto destination. An internationally acclaimed village of brick-lined streets and dozens of authentically restored Victorian-era buildings, the Distillery District is one of Downtown East’s most invigorating attractions. This charming locale is just one of many nightlife destinations mere steps from your front door. Along Queen, King and Front Streets you find live theatres, art galleries, fashion, design and jewelry boutiques, unique cafés and award-winning restaurants.